Hungarian rabbi; born in Komorn; died at Ofen in 1886. He studied at Papa, and was rabbinical assessor of Austerlitz, Gross Kanizsa, and Esztergom. From 1876 until his death he was rabbi at Somogy-Csurgó. 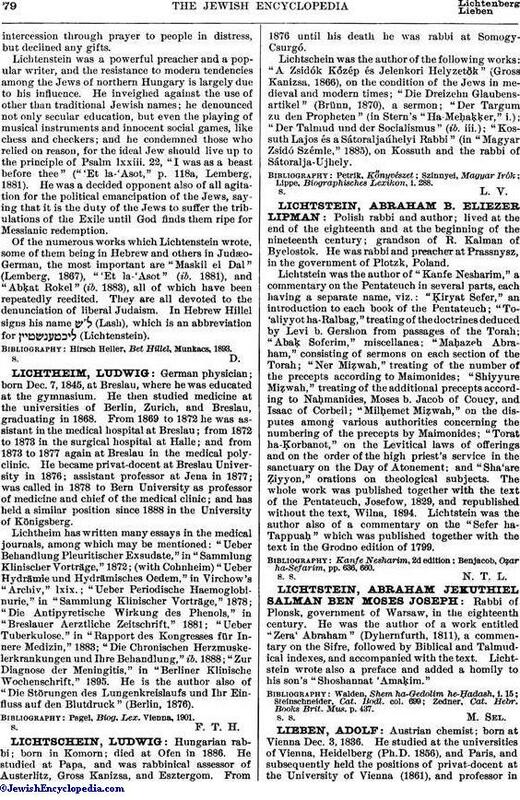 Lichtschein was the author of the following works: "A Zsidók Kőzép és Jelenkori Helyzetők" (Gross Kanizsa, 1866), on the condition of the Jews in medieval and modern times; "Die Dreizehn Glaubensartikel" (Brünn, 1870), a sermon; "Der Targum zu den Propheten" (in Stern's "Ha-Meḥaḳḳer," i. ); "Der Talmud und der Socialismus" (ib. iii. ); "Kossuth Lajos és a Sátoraljaúhelyi Rabbi" (in "Magyar Zsidó Szémle," 1885), on Kossuth and the rabbi of Sátoralja-Ujhely. Lippe, Biographisches Lexikon, i. 288.